KATHMANDU, March 6 : Come May this year and a 86-year-old former Gurkha will be ascending the tallest peak in the world, Mount Everest, to win back oldest Everest summiter record. At a press conference organized by 'Min Bahadur Everest Expedition' campaign here today, Min Bahadur Sherchan, who hails from Tatopani in Myagdi, shared about his upcoming Everest expedition. Campaign coordinator Jit Bahadur Gharti Magar shared that Sherchan would be climbing Everest for cause of world peace and protection for mother Earth besides winning back the record. 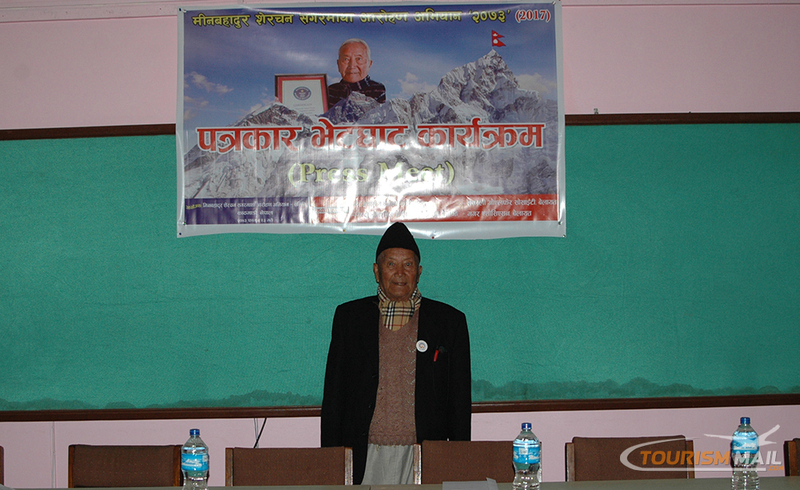 Sherchan had reached atop the Everest at the age of 76 in 2008 and recorded his name in the Guinness Book of World Records in 2010. Five years later, his record was broken by an 80-year-old Japanese national, Yuichiro Miura. Sherchan is currently in a bid to break the Japanese national's record and reclaim his title. Towards this, Coordinator Gharti Magar added that Sherchan had made an attempt to scale Everest, locally known as Sagarmatha, in 2015 but could not make it due to the Gorkha Earthquake and avalanche followed by the quake. "Thus we launched a campaign for Sherchan in his record breaking spree," informed Gharti Magar, adding that various organizations such as Myagdi Non-Residents Nepali Association UK, Non-Resident Nepali Association UK, Thakali Association UK, Magar Association among others have joined the cause. Sherchan reaffirmed his commitment to win back the record, asserting, "I may be old in terms of age but I still have young courage. I will reach the peak of Everest come what may." On the occasion, sociologist Prof Dr Krishna Bhattachan underscored the need for the government to support Sherchan's cause, arguing that his ascend would add to the glory of Himalayan country like Nepal and its fellow citizens.